Being a great river guide takes a lot more than just whitewater skills. We sat down with Carly McCann, a Kumsheen Guide School Graduate (and one of Kumsheen’s many amazing guides) to talk about what she learned on and off the river. 1) What is your favourite memory from guide school? If I had to choose, I would say my favourite memory was our car ride to the Nicola River on the last day of guide school. It was the day of our practical paddle and oar exams, and nerves and excitement were running high. After two weeks together, all of us trainees had developed such a bond together. We had come so far in our rafting skills, and we had shared so many awesome experiences together over the span of those two weeks, it was such a bittersweet moment having it all come to an end. 2) How did guide school impact you/your peers? Guide school was so much more than just rafting. I think all of us trainees overcame so many challenges within those two weeks that it showed us all what we were capable of, on and off the river. There was so many memories and unforgettable moments, I think each every one of us were really proud of ourselves and of each other by the end of it. 3) Is there a specific moment you will always remember – funny or meaningful? I will always remember the feeling of hearing everyone’s times for their flip drill exam. One of the criteria for being fully certified is to perform a full flip drill under two minutes, and many of us (especially us females) were extremely nervous leading up to it. But watching each trainee step up to the plate and thrive under pressure was an incredible moment to witness. Everyone was high on adrenaline and cheering each other on like it was a sports stadium. And in the end, each and every one of us finished with times well under two minutes. It was awesome! 4) Besides river/rafting skills – what did you take away from the experience? I think guide school taught me how to perform under pressure, work with a team, and adopt a mind-over-matter mindset. Part of learning all of the practical skills involved overcoming my fears and training my mind to respond in high-stress situations. And in addition to the rafting, guide school was full of awesome camping adventures, road trips, new rivers, crazy fireside storytelling, hilarious one-liners, delicious food, and getting whipped into shape by the rivers! 5) What are some lessons or skills you or your peers were surprised to learn through guide school? I think a few trainees learned how to cook, believe it or not. I’m somewhat kidding, but there were definitely some surprising lessons learned throughout those two weeks. The first one that comes to mind is a safety discussion that instructor Braden Fandrich had with us one morning before we set off on the river. I think it was an eye-opening discussion for everyone. He essentially talked us through the responsibility involved with rafting because of the risk involved, and the importance of minimizing that risk, and how to respond appropriately to worst-case scenarios. Ironically, right after that discussion we ran into a sticky situation on the river that challenged each and every one of us to use adrenaline to our advantage and respond appropriately. In the end, I think that day really gave me a healthy respect for the river, and an appreciation for the rafting skills themselves. 6) What is your best advice for people considering guide school? My best advice for people considering guide school would be, if it scares you, then you should probably just do it. It is so much more than just rafting, it’s like a vacation, a 14-day rafting trip, and a boot camp all wrapped up into one. I’m kidding about the boot camp, but your body will definitely hurt for at least one of those weeks. But honestly, guide school is an experience in itself, it’s not just a step towards a rafting career. Prepare to meet some amazing people, eat like a king, see some beautiful rivers, hit a lot of rocks, learn how to not hit a lot of rocks, and paddle hard! And on top of all of that, you get to learn from the best of the best, and carry on towards your rafting career. Guide school will teach you so much about rivers, about rafting, and about yourself. My final advice is just make it happen, and then make sure to bring endless amounts of warm layers, and prepare to get wet!! 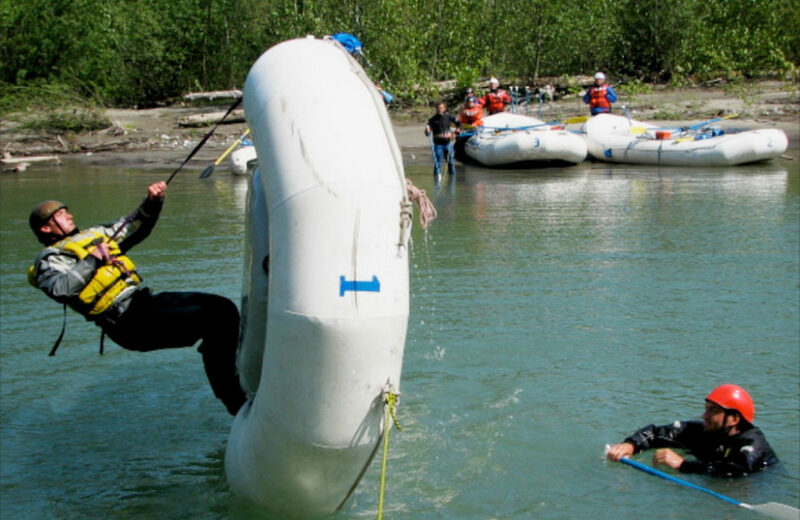 For more information about Kumsheen’s raft guiding school click here.